Gabriela G. Hässel de Menendez; Marta F. Rubies: Catalogue of Marchantiophyta and Anthocerotophyta of southern South America. Chile, Argentina and Uruguay, including Easter Is. (Pascua I. ), Malvinas Is. (Falkland Is. ), South Georgia Is., and the subantarctic South Shetland Is., South Sandwich Is., and South Orkney Is. Vol. 65/1-4. : Microalgae. Aspects of Diversity and Systematics. Volume dedicated to Ursula Geissler. Ed. by Regine Jahn (Guest editor), Barbara Meyer & Hans R. Preisig. 1997. 452 p., 1011 figs., 37 tab., 18 maps, 4 diagrams, 24x l7cm. paperback DM 328.- / $193. covers 27 papers dedicated to Ursula Geissler on the occasion of her 65th birthday. contents: Mini-review: Is the origin of the diatoms related to the end Permian mass extinction? (L.K. Medlin, W.H.C.F. Kooistra, R. Gersonde, P.A. Sims & U. Wellbrock); Assessing and designating diatom taxa at or below the species level - a consideration of current status and some suggested guidelines for the future (E.J. Cox); Intraclonal variation of the tripolar pennate diatom "Centronella reicheltii" in culture: strategies of reversion to the bipolar Fragilaria-form (A.M.M. Schmid); The transfer of Asterionellopsis kariana to the new genus Asteroplanus (Bacillariophyceae), with reference to the fine structure (R.M. Crawford & C. Gardner); Sporadic evolution of dorsiventrality in raphid diatoms, with special reference to Lyrella amphoroides sp. nov. (D.G. Mann & A.J. Stickle); Fogedia gen. nov. (Bacillariophyceae), a new naviculoid genus from the marine littoral (A. Witkowski, D. Metzeltin, H. Lange- Bertalot & G. Bafana); Taxonomische Revision des Artenkomplexes um Gomphonema pumilum (Bacillariophyceae) (E. Reichardt); Taxonomische Probleme bei aehnlichen syntopischen Sippen am Beispiel einer Encyonema-Assoziation (Bacillariophyceae) aus dem Kivu-See, Zaire (K. Krammer); Comparative studies among four linear-lanceolate Achnanthidium species (Bacillariophyceae) with curved terminal raphe endings (H. Kobayasi); Eunotia valida and E. pseudovalida spec. nov. (Bacillariophyceae): ultrastructure of the valve and girdle (S. Mayama); Taxonomy, ultrastructure and biogeography of the Actinella punctata species complex (Bacillariophyta: Eunotiaceae) (J.P. Kociolek, K. Rhode & D.M. Williams); Fine structure of the marine diatom Plagiogrammopsis panduriformis, spec. nov. (Cymatosiraceae) (D. Schulz & G. Drebes); Morphology and taxonomy of the centric diatom Cyclotella atomus (H. Hakansson & K.B. Clarke); Cyclotella tripartita (Bacillariophyceae), a dominant species in the oligotrophic Lake Stechlin, Germany (W. Scheffler & J. Padisak); Merkmalsvariabilitaet bei planktischen Diatomeen in Berlin- Brandenburger Gewaessern (K. Teubner); Tiefenverteilung epiphytischer Diatomeen auf Characeen eines oligotrophen Sees (Lustsee, Deutschland) (U. Raeder, S. Burger A. Melzer); Benthic diatom assemblages as indicators of water quality in an urban flood-water impoundment, Neue Donau, Vienna, Austria (M.T. Dokulil, R. Schmidt & S. Kofler); Boden-Diatomeen einer landwirtschaftlichen Nutzflaeche bei Potsdam, Deutschland (A. Hahn & W. Neuhaus); Mallomonas species (Synurophyceae) in eutrophic waters of Berlin (Germany) (A. Gutowski); Silica-scaled chrysophytes from the Taymyr Peninsula, Northern Siberia (J. Kristiansen, L. Duewel & S. Wegeberg); Cryptomonas undulata spec. nov., a new freshwater cryptophyte living near the chemocline (F. Gervais); The thecal structure of Peridiniopsis amazonica spec. nov. (Dinophyceae), a new cyst-producing freshwater dinoflagellate from Amazonian floodplain lakes (B. Meyer, H. Rai & G. Cronberg); Zoospore ultrastructure of the rare coccoid green alga Pachycladella umbrina (Chlorophyta, Chlorophyceae) (T. Friedl & O.L. Reymond); Bestandsveraenderungen der Desmidiaceen im Naturschutzgebiet Barssee und Pechsee (Berlin) in den letzten siebzig Jahren unter anthropogenen Einfluessen (T. Scheer & W.-H. Kusber); The unique phytoplankton community of a highly acidic bog lake in Germany (L. Krienitz, A. Hehmann & S.J. Casper); Studies on algal drift in a small soft-water stream in the Spessart mountains, Germany (P. Leukart & D. Mollenhauer); Rediscovery of the multiflagellated protist Paramastix conifera Skuja 1948 (Protista incertae sedis) (M. Zoelffel & O. Skibbe). 453 pages, many B&W photographic plates. Nova Hedwigia Band 79 Heft 1-2. Culture Collections of Algae: Increasing Accessibility and Exploring Algal Biodiversity. Ed. : Friedl, Thomas; Day, John G.; Preisig H.R. 2004. Preface: This volume aims to outline the value of algal culture collections to the user community and, at the same time, presents the proceedings of an international meeting held in 2002, which provided a forum for algal culture collections from all over the world to improve interactions among them. Culture Collection of Algae have, in essence two key functions: They provide consistency and quality, traceable source material and information. They are, de facto, sources of biological standards and without these standards comparative taxonomic, physiological, ecotoxicological and ex situ ecological studies are impossible or, at best, problematic. The value of collections to the user community is widely recognized, not least in that they provide cultures that are often difficult or virtually impossible to re-isolate from their natural habitats, even when the original source is known and accessible. They provide a store of well characterized diversity for research and/or exploitation. The holdings of algal collections are extremely diverse and it is the collections' aim to make available and conserve ex situ as much of the great morphological and genetic biodiversity of microalgae as possible. For phylogenetic and taxonomic studies authentic strains, i.e. cultures derived from the material used for the original description and naming of the species, are particularly useful - these and the vast literature published on the algal culture collections' holdings make them irreplaceable and unique international resources. Nova Hedwigia, Beihefte/Supplementary Issues. Monographs on cryptogamic research. 24x 17 cm. Beih. 82: McLaughlin, Robert M. & Stone, John L.: Some late Pleistocene diatoms of the Kenai Peninsula, Alaska. 1986. 149p., 16pl., <ISBN 3-443-51002-7> paperback DM 90./ $58. This report is a study of the fossil freshwater diatoms from two deposits on the Kenai Peninsula,Alaska. These deposits, averaging from 2 to 6 feet in thickness, crop out along the sea cliffs bordering Cook Inlet, some 5,5 to 11,5 miles northward of the village of Kenai. They contain a flora encompassing 344 species, varieties and forms of diatoms, including 21 new taxa. The deposits overlie some 13 feet of glacial outwash with a carbon- 14 age between 8000 and 14000 years B.P. Beih. 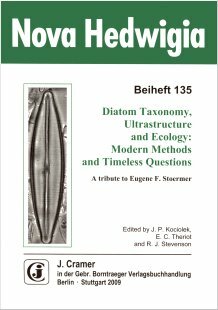 106: Progress in diatom studies: contributions to taxonomy, ecology and nomenclature. Special volume in honour of Robert Ross on the occasion of his 80th birthday. Ed. by Patricia A. Sims. 1993. XIV, 377 p., <ISBN 3-443-51028-0> paperback DM 190./ $112. Contents (partly): Cox, E.J. : Diatom systematics - a review of past and present practice and a personal vision for future development/ Williams, D.M. : Diatom nomenclature and future of taxonomic database studies; Nikolaev, V.A. : The "pore" apparatus of centric diatoms: A description of terms; Mann, D.G. & A.J.Stickle: Life history and systematics of Lyrella; Kociolek, J.P. & E.F.Stoermer: The diatom genus Gomphocymbella O. Mueller: Taxonomy, ultrastructure and phylogenetic relationships; Krammer, K. & H.Lange-Bertalot: Cymbella rossii spec.nov., a new "nonconformist" in the genus Cymbella; Carter, J.R.: A note on the genus Berkella Ross & Sims.